Phone enthusiasts rejoice: the Galaxy S5 is almost here! Set to hit stores this spring, Samsung’s new flagship phone is already making waves. The device made its first appearance this week at the Mobile World Congress in Barcelona, wowing audiences with its largest screen and longest battery life to date. Samsung continues to partner with Google using their Android software, and the phone will have 4G compatibility. But that’s not what Samsung wants consumers to focus on. Samsung is hoping to corner the high-end consumer market and take business away from their biggest competitor, Apple, especially after experiencing their lowest growth in earnings since 2011, partly due to Apple’s release of the iPhone 5s last year. What makes them direct competition this time around is the introduction of fingerprint technology, a feature currently found solely on the iPhone 5. With the Galaxy S5 you will be able to access your phone through a fingerprint reader, giving your gadget more protection than with an easy-to-crack password. What’s more, the smartphone is now waterproof, being able to withstand up to 30 minutes in three feet of water. Aesthetics is just as important, and Samsung is hoping consumers are attracted to the new design and colors. Forget the typical plastic case – the Galaxy S5 has a leathery feel that now comes in four colors: black, white, blue or gold. Boasting a higher resolution camera and a high definition screen, the S5 is flashier than the S4, and a bit bigger too. 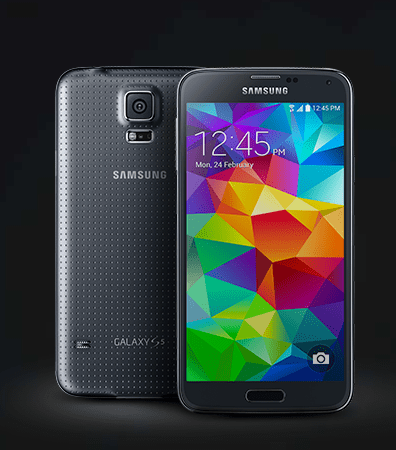 The Galaxy S5 is set to hit stores April 11.